The recognition and discovery of colors and shapes makes the child's first step toward the world of learning. Constant practice using colors and shapes is important for their cognitive and creative development. These exercises focus on various aspects of perception of colors and shapes to promote visual perception ability. This workbook contains exercises to help children develop the ability to differentiate colors and shapes. All exercises are designed to promote children's visual perception ability, which is the foundation for reading, writing, and doing math. Through working on these exercises, children improve accurate observation, understand interrelation, and enhance visual thinking skills. 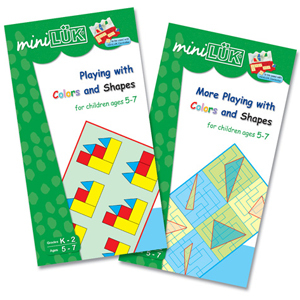 This workbook helps children develop the ability to differentiate colors and shapes. All exercises are designed to promote children's visual perception ability, which is the foundation for reading, writing, and doing math. Through working on these exercises, children improve accurate observation and memory, understand interrelation, and enhance visual thinking and association skills.